Bridgetown, Barbados (TDN) The Caribbean Development Bank (CDB) has made energy security a cross-cutting theme in its new Strategic Plan 2015 to 2019 to help stimulate growth, leverage broader development assistance and improve CDB’s role as a development partner in borrowing member countries (BMCs). In 2014, the Bank produced a study “A New Paradigm for Caribbean Development: Transitioning to a Green Economy”, which examined the merits of transitioning to increased energy efficiency and use of renewable energy. in the Eastern Caribbean for investing in energy efficiency and renewable energy. “Also, we expect to be financing not only investments, but technical assistance for building capacity and strengthening legislative and regulatory frameworks,” said Tessa Williams-Robertson, head of the bank’s renewable energy and energy efficiency unit. “The Caribbean Development Bank (CDB) has stepped up its drive to encourage public and private sector investments in sustainable energy – energy efficiency and renewable energy projects as a matter of priority, in spite of lower oil prices, with a range of funding and technical assistance programmes that can be tapped by governments and commercial interests to support projects in solar, wind and geothermal energy, as priorities, but would support other renewable energy options such as bio-energy,” she noted. “We are looking at the inclusion of renewable energy and energy efficiency components in all of our projects wherever the opportunity presents itself. The Bank is now developing special products to support renewable energy and energy efficiency projects on concessionary terms. Two such special facilities are the geothermal energy development facility and the proposed Sustainable Energy for the Eastern Caribbean (SEEC) Programme. The SEEC is under consideration by EU Caribbean Investment Fund and DfID for grant funding, and is now in the final stages of approval,” Williams-Robertson added. She said the multi-lateral funding agency was particularly keen to support projects in solar, wind and geothermal energy as priorities, but would support other renewable energy options such as bio-energy. Last year CDB, Inter-American Development Bank (IDB) and Japan International Cooperation Agency (JICA) signed a memorandum of cooperation to collaborate on the promotion of renewable energy and energy efficiency in the Eastern Caribbean, with a special focus on geothermal energy development. 2. CDB, the Japan International Cooperation Agency and the Inter-American Development Bank signing of a memorandum of co-operation for the financing of renewable energy and energy efficiency in the Eastern Caribbean, with special focus on geothermal development. In addition, a new sustainable energy for the Eastern Caribbean Programme is being designed as a multi-donor trust fund to benefit member countries of the Organisation of Eastern Caribbean States (OECS). Initially, the resources will include grants from European Union-Caribbean Investment Facility, and the United Kingdom’s Department for International Development as well as loan funds from CDB. As part of the CDB’s 2014 projects “Changing the Caribbean”, Smith disclosed that a special product called a policy based loan (PBL) offered resources at extremely low interest rates to support Trinidad and Tobago with a USD$40 million loan for the conversion of the fuel usage of vehicles in the transport sector from diesel and gasoline to compressed natural gas (CNG). This will have positive impacts for the country through a reduction in the fiscal burden of rising fuel subsidies and also improve the environment via the switch to cleaner burning natural gas. 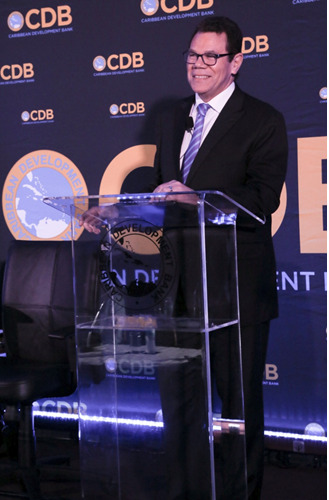 Also, on December 11, 2014, the government of Jamaica was approved by the CDB’s board of directors to receive USD$35 million via a PBL to assist in improving debt dynamics and reforms geared towards the achievement of fiscal and debt sustainability; improving the environment for doing business in an effort to achieve sustainable growth rates of around two percent; and mitigating the potential adverse impacts of the programme on the more vulnerable groups in Jamaica. This approach by the CDB is expected to help broaden the development impact and the bank’s intervention for reducing poverty in borrowing member countries (BMCs), alongside a climate resilience strategy for sustainable energy that contributes to the achievement of targets set within CARICOM’s sustainable energy strategy. “In the energy sector, substantial investments are required to replace obsolete and inefficient generation, transmission and distribution plant over the next five years and to exploit the region’s vast renewable energy potential,” Smith said. Renewable energy and energy efficiency are key areas of focus for CDB because of their potential for transforming the Caribbean. The renewable energy/energy efficiency unit, established in 2014, has been working to build and strengthen new partnerships and to mainstream renewable energy and energy efficiency across the bank’s operations, he explained. 3. to confirm CDB as a key financier for the energy sector, acting as a catalyst for attracting concessional resources to the region. “During the year, we emphasised the adoption of renewable energy and energy efficiency solutions in small and medium-sized businesses. These were financed by lines of credit intermediated through the development finance institutions in Dominica, Belize, and Jamaica. “CDB approved a $22 million loan to Suriname for technical and vocational education and a $16 million loan for the transformation of the College of The Bahamas. It is noteworthy that both projects include funding for renewable energy and energy efficiency enhancements. “At CDB, we will intensify our efforts in 2015 to meet the needs of the Caribbean region. We will draw inspiration from the enthusiasm and energy of the 40-plus new members of the CDB family; and we will achieve the results to which we have committed in our 2015 work programme,” Smith added. Category/ies:Bahamas Articles, Bahamas News, Barbados Articles, Barbados News, Belize Articles, Belize News, Dominica Articles, Dominica News, Funding Source, Jamaica Articles, Jamaica News, News, Regional Articles, Regional News, Suriname Articles, Suriname News.